A public notice from the I.S. Army Corps of Engineers discussing the possible approval of bridge plans proposed by the Florida State Road Department. The plans are for a replacement of an existing bridge, where Florida State Road 48 (SR 48) crosses the Apopka-Beauclair Canal in Mount Dora. The goal of distributing the public notice is to collect data in support of or opposition to the proposed bridge plans. A map and schematics are attached. Original notice, November 29, 1966: binder 1966, Friends of Lake Apopka Archives, Ginn Museum, Oakland Nature Preserve, Oakland, Florida. Digital reproduction of original notice, November 29, 1966. 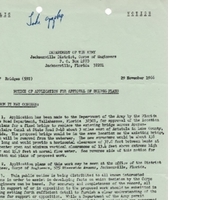 McKnight, A. L.. “Notice of Application for Approval of Bridge Plans.” RICHES of Central Florida accessed April 20, 2019, https://richesmi.cah.ucf.edu/omeka/items/show/6836.